Career Titles: 63 Birthplace: Washington, D.C.
After winning 31 consecutive matches at Wimbledon, Sampras was dethroned in the fourth round by young Swiss Roger Federer 7-6 (7), 5-7, 6-4, 6-7 (2), 7-5. The defeat, his first at the All England Club since a quarterfinal loss to Richard Krajicek in 1996, ended his bid for a record-tying fifth consecutive title. 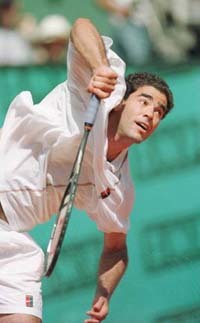 Seeking the only Grand Slam title that he has not won, Sampras lost in the second round of the French Open to Galo Blanco.Fell to fellow American Todd Martin in the fourth round of the Austaralian Open. Unseeded Martin won 6-7 (2), 6-3, 6-4, 6-4. Reached three finals Indian Wells, Los Angeles, losing both to Andre Agassi, and Long Island, where he fell to Tommy Haas. Won ESPY award for Outstanding Men's Tennis Performer and another for Record-breaking Performance of the Year. With a four-set victory over Patrick Rafter in the Wimbledon final, surpassed Roy Emerson's record for Grand Slam titles with his 13th. Dealing with acute tendinitis above his left ankle from the second round on, won his seventh Wimbledon crown to go with four U.S. Opens and two Australian Opens. The seven Wimbledon titles tied Willie Renshaw, a player in the 1880s, for the most at the All England Club. Reached final of U.S. Open, but was a straight-sets loser to Marat Safin. Also made the semifinals of the Australian Open, dropping a five-set decision to eventual winner Andre Agassi. Finished season with 42-13 record and more than $2.24 in earnings. Beat Andre Agassi to win the year-ending ATP Tour World Championships for the fifth time. It was not enough to claim the No. 1 ranking to finish the year -- the first time he has not finished as the top-ranked player in six years. He ended the year ranked No. 3. A four-time champion and top-seeded man for a record-tying fifth time at the U.S. Open, he dropped out without playing a match due to a herniated disc in his back. His withdrawl put his attempt to break Roy Emerson's record of 12 Grand Slam titles on hold. Became the first man in the Open era to win Wimbledon six times when he beat Andre Agassi 6-3, 6-4, 7-5 on July 4. With the win, he also tied the record with 12 Grand Slam titles. Won the Stella Artois Championships -- his first title of the year -- in a tuneup tournament for Wimbledon. Competed for the United States' Davis Cup team but only played doubles in deference to teammates who had been competing all along for the U.S. He and Alex O'Brien staved off elimination in the quarterfinals with a 6-4, 6-3, 3-6, 4-6, 6-3 victory over Australia's Sandon Stolle and Mark Woodforde. Depite the effort, the U.S. lost to the Aussies. Has struggled with injury and fatigue, and started out the year by not competing in the Australian Open in order to get some rest. 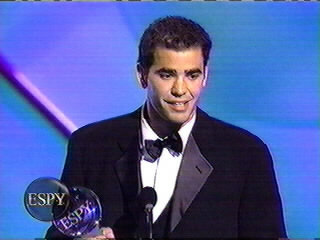 Won ESPY award for Outstanding Men's Tennis Performer. Was the No. 1 player at year's end for a record sixth consecutive year. He had to battle Marcelo Rios who stayed close up until the deciding ATP Tour World Championship in Hannover, Germany. Won his fifth Wimbledon title -- edging Goran Ivanisevic 6-7 (2-7), 7-6 (11-9), 6-4, 3-6, 6-2 -- tying him with Bjorn Borg for the men's record in the open era. Sampras, Bjorn Borg and Rod Laver have 11 Grand Slam titles; Roy Emerson's record is 12. Won the CA Trophy in Vienna, Austria; AT&T Challenge in Atlanta, Ga., and the Advanta Championships in Philadelphia for the fourth time in his career. Has won at least one Grand Slam title in each of the last five years. Blasted his way to a fourth Wimbledon title in five years by downing Frenchman Cedric Pioline, 6-4, 6-2, 6-4, in the final. Started the 1997 campaign by defeating Spain's Carlos Moya in straight sets to claim his second Australian Open crown. Entered the year ranked No. 1 in the world for the fourth consecutive year. Captured the U.S. Open title for the fourth time in September, defeating fellow American Michael Chang in the final. Eight titles in nine finals appearances in 1996, with wins in San Jose, Memphis, Hong Kong, Tokyo, Indianapolis, the U.S. Open, Basel and the season-ending ATP Tour World Championship in Hannover, where he defeated Germany's Boris Becker in an epic five-set final. Won Wimbledon for the third consecutive year, defeating Becker in four sets. Won career-high 10 titles, including his first Australian Open and second Wimbledon title. Was the first player to hold No. 1 for calendar year since Ivan Lendl in 1987. Upset Ivan Lendl, John McEnroe and Andre Agassi in the last three rounds of the U.S. Open to become the youngest men's champion at 19 years, 28 days. It all started when a small kid from California found an old tennis racquet in his basement and started hitting a tennis ball off of a garage door. When the shots began to make dents in the door, they all knew this kid was something special. 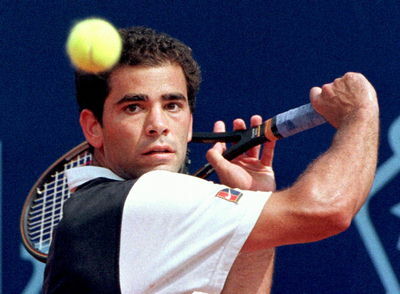 Pete Sampras started playing tennis young and makes no plans to stop anytime soon. The man who has a calm demeanor, boyish shyness and the looks of a star proves again and again what so many players, critics and fans can't deny: he can win, and always does. 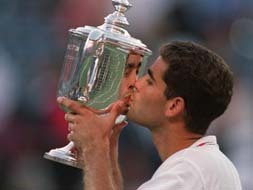 In 1990, when Sampras was only 19 years old and seeded twelfth in the U.S. Open, he slammed his way into the finals and became the youngest man to win the tournament. And we all knew after that first Grand Slam victory there would be no looking back. Over the years, the quiet giant has gone on to win eleven more Grand Slams: 6 Wimbledons, three more U.S. Opens, and two Australian Opens. Sampras's most beloved titles have come on the grasses of the All England Lawn Tennis and Croquet Club. In 1993, he won his first Wimbledon title, and since that year, has gotten to and won in every final, except for a quarterfinal defeat by Richard Krajicek in 1996. He is the winningest man at Wimbledon in the Open Era and is one championship away from tying the all time record of seven titles that was set in the late 1800's. The historic grounds of Wimbledon and the intimate Centre Court has become a home to Sampras, a "cathedral" as he once said. His undeniably flawless grass-court tennis game has made him the best tennis player of his time, and he will undoubtedly go down in the history books as the greatest. Pete Sampras is one of the last classic serve-volley players, possesses the most effective and powerful serves on tour, and handles himself in a way that could only be described as gentlemanly and reserved. On the court, he lets his racquet do the talking. He does his job. He goes on the court to win a match, not to impress the crowds. He enters tournaments to win them. And when he wins them, as he so often does, his posture gets a little straighter, his eyes get a little brighter and a shy, timid smile of pleasure spreads across his face. It is a truly beautiful moment to watch history be made. And with every new win, every new championship title, history books are being rewritten to tell the story of one Pete Sampras. Some people are huge, but you never see it.Pete has been grace under pressure in his repeated championships at Wimbledon and the U.S.Open. Pete is not heavily involved in ego campaigning. He is a great team player. He lets you find out his greatness rather than giving you his resume. We salute Pete and give him the Role Model Sleeping Giant Award! Personality Style: Pete has an easy-going nature, but on the court he has an aggressive serve along with a competitive style that has won him many fans as well as Grand Slam titles. As a personality, Pete is very straightforward, sincere and candid. Fans like his direct, easygoing approach. 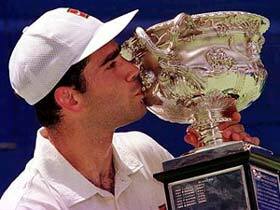 Role Model Profile: Pete Sampras is one of the most admired all-American tennis players. He is a versatile player who masters any situation. He has integrity the way he plays and the way he lives his life. He has a determination that is an inspiration to others and a motivating force among youths. Pete started getting noticed on the tennis tour in 1988 as a 16-year old qualifier. He played a game they called "dangerous." It took him two years to reach the top ten, and along the way he defeated several of the great tennis legends. His first Grand Slam title was the U.S. Open that he won in 1990 with an unbelievable serve that stunned players like Agassi, Lendl, and McEnroe. At age 19, Pete was the youngest tennis player ever to win the coveted U.S. Open cup. In 1991 Pete added the IBM World Championship onto his string of victories and in the next year he helped the U.S. to win back the Davis cup. With his likable, relaxed attitude he showed that he could be a great team player. His next big accomplishment came in 1993 when he made a new record for the tour history books by slamming 1000 aces in a single season. Because of this record it helped him to win Wimbledon and the U.S. Open. Soon after this he won the Australian Open in 1994. This made him the first player to win three Grand Slam tournaments in a row in 25 years. Since 1993 he has finished with the tour's ranking of Number One every year since 1993. The only other players to have ever achieved this were John McEnroe and Jimmy Conners. While Pete Sampras tries to keep a low profile, it's getting harder and harder considering that he is now a four-time Wimbledon champion (1993, 1994, 1995, 1997). He has also just won his 10th career Grand Slam title. Best Quality: Pete has great staying power. That's a big part of his appeal. Professional Ranking: In the last few years (1993, 1994, 1995), Pete has been the world's Number 1 ranked player . Other Honors: Pete reached the 3rd round of the singles competition in the 1992 Olympics. Pete was a gold medalist in men's singles at the 1987 U.S. Olympic Festival and was named USOC Athlete of the Month for July 1995. He finished third in 1994 and 1995 in the USOC's voting for Athlete of the Year. 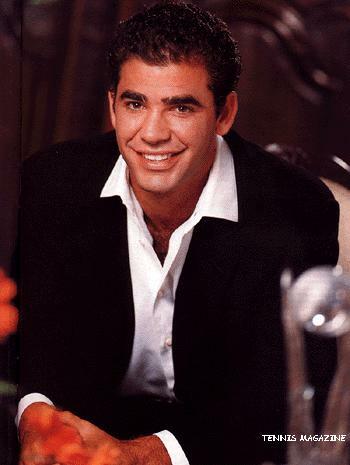 Family: Pete is the son of Greek immigrants, Sam and Georgia Sampras . He is one of four children that include his brother Gus, and his sisters Stella and Marion. He was born in Washington, D.C., the third child. His father was working for the aerospace field for the Department of Defense. At night his father worked at a deli where he was a part owner. Even as a boy, Pete showed signs of having outstanding athletic ability. As a youngster, Pete discovered a tennis racket in the basement of their house in Potomac, Maryland. He used to spend hours hitting balls against the basement walls. In the summer of 1978, the Sampras family drove across the U.S. to Palos Verdes, California, outside of Los Angeles. Sam Sampras had accepted a new job in the aerospace industry. The family was happy about moving into a warm climate. Seven year old Pete Sampras became more and more involved in the game of tennis. The hit the ball beautifully -- like a pro. Soon the family joined the Peninsula Racquet Club. They played a great deal of tennis together. It was soon apparent that Pete was a tennis Prodigy. At age 11, he could pick up volleys at the service line, and hit low volleys will all the ease in the world. Other sports: Golf is a favorite of Pete's. He says that if he wasn't a professional tennis player he would have played professional golf. His reasons? Golf is a sport that you can play for 30 years. In tennis, your career only lasts 10 or 12 years. In tennis, your body takes a lot of pounding, and golf is easier on the body. On His Game: Clay is not his best surface. Winning against the French meant clay courts and that was a big hurdle for him. The tournament in France was doubly hard for him considering that his coach had just passed away. But Pete purposely puts a lot of pressure on himself. He thrives on pressure and that's one of the things that makes him a champion. Goal: " Every year my goal is to try to win one big Grand Slam, and if I do it's a good year. If it's two it's a GREAT year!" Q. People talk about your first and second serve, talk about the way you play the big points. What is the one thing about your game that has most contributed to your success on grass, specifically at Wimbledon? PETE SAMPRAS: I think a couple things. I think my second serve, if I'm not serving well, is still very effective with spin and placement. I think my movement on grass is part of the battle. I'm playing well on grass. That's an area that people don't talk much about. I think my movement is a big asset to have. Playing the big points, being able to raise it at certain moments of the match. I think a combination of those things is the reason why I've been successful there. I've also been pretty fortunate in a lot of close matches there. Q. In London, The Guardian has a story from June 11th, "Pete Sampras, at his lowest ebb for a decade. His French Open was a disaster. The once invincible American has his last realistic attempt at a Wimbledon." Is this your last realistic attempt? Are you at the lowest ebb for a decade? SAMPRAS: Well, I think whatever article that was a bit of a stretch. Sure, obviously after the year in Paris I was deflated about my clay court run. But that being said, you know, I still feel like I will be a threat at Wimbledon for the rest of my career. I plan on playing this game for many years. I always feel like when it comes to this tournament that I'm still the man to beat. That's kind of how I look at it. Obviously, people are thinking that I'm hitting 30, I've done a lot in the game, is it time for me to go? I can just say that I plan on being around for quite awhile. Q. Take us back to finals last year, what you remember about that very special moment with your parents there, breaking Roy Emerson's record. SAMPRAS: Well, it's all pretty much a blur. It all happened so quickly. From being I felt like down and out, down a set, 4-1 in the breaker, to coming back and an hour later I was holding up the cup. It all happened the way I've always dreamt about breaking the record, at Wimbledon, having my fiancee there, having my parents there. I just realized it's as good as it's ever going to get. As an athlete, that moment, it's getting dark, a surreal atmosphere, it's still firmly in my mind. It's the way I've always wanted to break the record one day, to have my parents there, who don't come around much, to share that with me was very special. Q. At this point in your career, and also if you take the last couple months, how much do you need Wimbledon to get you going, keep you motivated in the game? SAMPRAS: Well, like I've talked about for the past week, just kind of walking into the club, being on centre court, like I've been the last couple days doing interviews, there's no problem getting the motivation and passion back for the game. The court is that special to me. Wimbledon is so important to the sport of tennis. I know deep down that I have the ability to really turn my year around very shortly. I've kind of come into Wimbledon the last number of years with kind of sub-par years, like this one. For some reason, I'm able to turn it up a notch in the second week, and I've won here. Hopefully that happens again. Q. Last year it was a good scene for you having your parents there. Are they going to make the trip this year? SAMPRAS: They will not. I think I tortured them enough last year (laughter). Q. Where do you feel your game is right now coming into this year's Wimbledon? SAMPRAS: I feel fine. I feel like I had a pretty productive week in Queen's, lost a tough match to Hewitt, but I beat some pretty decent players that week, got some good matches. I've had a good week of practice. I think everything is where I want it to be. I'm healthy, which is nice, hitting the ball fine. I've been here quite awhile getting used to the grass. I feel like I'm prepared as well this year as I've been in any other year. Hopefully it all happens again. Q. You had such a great record at Wimbledon. When you play some of these matches, how often do you feel like players are defeated before they even walk on the court with you? SAMPRAS: I don't feel like they're defeated. If anything, I just have a bit more of an aura playing here than anywhere else in the world, because of the grass, I love playing on it, what I've done here over the years. It's not defeating. I don't feel like I've won the match walking out. If anything, these guys come out with nothing to lose, they kind of swing away. Strange things can happen out there. You know, it helps having the reputation, the experience of doing well here over the years. But there are no easy draws or easy matches out there; you have to work for it. Q. As the years go on, particularly after last year with the record, is it possible to have a sense of enjoyment as you proceed through Wimbledon or a sense of being an active participant in tennis history as you go on? SAMPRAS: Well, I think, if anything, I'll enjoy Wimbledon a lot more this year than last year. I felt so much pressure - pretty much self-inflicted - because of the record. This was a great chance for me to do it. I was kind of dealing with an injury throughout the two weeks. This year I feel a lot more relaxed going into Wimbledon, which hopefully I can play a bit better than last year. Last year I didn't feel like I was quite at my best. Q. Just do you feel like you're being an active participant in tennis history as you go along? SAMPRAS: Yeah, I just kind of am an active participant - probably more than a participant. I want to play at the highest level and try to add on and try to win another major here over the next couple years in two weeks. That's why I continue to play, and I still enjoy playing against the best players in the world in the biggest arena. Definitely still a lot of passion and motivation I still have for the game. Q. You get to play most of your matches on center court. Do you think there's a decided advantage by playing your matches there? SAMPRAS: Yeah. I mean, I'm very comfortable with the speed. I'm comfortable with the surroundings. You know, when I walk out, I feel like I'm walking out on my court at my home. It's a comfort level that I don't have to think twice about, what it's going to be like. I love the court because it's so -- it's small, intimate, you get to see the people. You play in some of these stadiums around the world, you don't feel connected to the people. Wimbledon, you feel a certain connection. It only helps the atmosphere and eventually playing better. Q. What is it about these two weeks that gets you going? You said you saved years with a good two weeks. Is there anything particular you can say, besides center court, stuff like that? SAMPRAS: Well, you know, the event means a lot to me, just like all the Slams, but this one in particular because of what I've been able to do here over the years. I felt like there's so much history and character that I felt like just the world was watching here. You know, you kind of go with that attitude. You walk through the club to get to the court. There's no other place like it. But that being said, the surface helps my game. I feel like - I don't know - I just feel confident out there. I feel like I've gotten my breaks at Wimbledon more than any other place, won a lot of close matches. You combine all that, that's why I've had this unbelievable run. Q. You won Wimbledon for the last four years. You won the tournament seven times. Is the challenge still the same this year? SAMPRAS: I'm still the man to beat. You feel like everyone is kind of gunning after you. You feel that. You know, that being said, there's nothing for me to prove here at Wimbledon. After breaking the record last year, I still feel a lot more relaxed coming into this year's Wimbledon. See if I can kind of turn the year around over the next couple weeks. Q. Also, you might have already answered this. Aside from Wimbledon being on grass, what for you personally sets Wimbledon apart from the other Grand Slam events? SAMPRAS: I just think the history that Wimbledon brings to the sport of tennis. You look at the stadium 70 years ago to today, it hasn't changed at all. You don't see a lot of sponsors up. It hasn't changed. It's maintained the history so many years later. It just separates it from any other tournament. It being the only major on grass, where they used to play three of them on grass 30 years ago, I like it. I like that it brings something different to the sport. You know, there's a certain panache, if you want to call it that, that Wimbledon has that not a lot of places do have. Q. You talked a little bit about the aura, not a defeatist attitude from the other guys, but the aura for you walking out on center court. Are there moments in big matches when you sense an advantage simply because of what you've accomplished there? SAMPRAS: No, I don't feel like my opponents are any less intense or a defeated attitude. It's just my game that I feel like at certain moments of the match where you just raise it a level, you just play good tennis. You know, I just feel like it's my ability against his. On grass, most places around the world, I feel like my ability is just as good as his. For some reason here, I've been able to put it all together all at the same time. Once you have that as a tennis player, you feel like you're unstoppable. Q. You said earlier in your career you didn't like the speed, bad bounces, had to change your strokes. Can you remember the time that happened? Your first two or three trips were early outs. SAMPRAS: They were. Wasn't till I started working with Tim Gullikson in '92, we decided to change my attitude, to having a better attitude, changing my strokes a little bit, shortening them up, being a little bit more concentrating on my returns, because that's how you win Wimbledon, is by returning serve well. Those two things in '92, I got to the semis, lost to Goran in a tough match. Next year I won there. The year of '92, working with Tim, definitely helped just kind of, you know, get over the hurdle of playing on grass. Q. You talked a lot about how Wimbledon has been a turnaround point for you. Is just getting to Wimbledon, practicing on the grass, does that start the turnaround for you? SAMPRAS: Well, it's kind of getting over another year the French Open disappointment. When you get on the grass, you enjoy hitting on it, playing on it. Being around the club, hitting at the courts at Wimbledon, you just kind of are looking forward to the tournament. You're getting ready, pumped up. You feel like you're getting ready for the Super Bowl. That's a good feeling. Then the feeling that all the top players look forward to having because it's going to be a good two weeks that could be anyone's tournament. Q. You talk a lot about last year breaking the record. This year you can match Bjorn Borg's mark of five consecutive Wimbledons. Do you look at that much? SAMPRAS: You know, I don't. I really don't look at comparing myself to Borg and the five. I'm just trying to win this year's Wimbledon, trying to do the well next two weeks. It's nothing more than that. Obviously, last year was a different story because of that overall Grand Slam record. But the five really hasn't been a big focus of mine. Q. You talked about being more comfortable at Wimbledon where you've been so dominant for so many years now. Is there a certain point where you can remember the comfort level really being there? Was there a certain turning point in that for you? SAMPRAS: Well, I think once I won for the first time, when I beat Courier in '93, then came back the next year and beat Ivanisevic in the final. I think after defending, I think that -- when you defend a Slam, it's the toughest thing to do in sports, especially tennis. Once I did that, I pretty much breezed through the tournament that year. I just felt like, "Wow, for the time being, this is kind of my home." Then I think I confirmed it when I actually beat Becker the next year for my third. That was like I'm starting to get this run, get this confidence and aura that guys are feeling that really has transcended into something where I'm sitting here with seven. I never expected to take it this far. I was just trying to win one of these. It's gone much better than I ever thought it would. Q. Describe what it's like for you to walk out on the court. Is it a calming effect? Is it a butterfly effect? SAMPRAS: Well, I always make a point to go to the court before the tournament starts because it is quiet and peaceful. You just take a seat and look around. You just look at the court and you kind of flash back on a lot of great moments that I've had, a lot of tough finals that I've won. A lot of times I've taken that circle around the court holding up the cup. This year I was obviously thinking about what happened last year. You kind of just draw back on past experiences there. You know, you feel pretty good about yourself when you've lost one match there over the past eight years. It's a court that I wish they traveled with it and I could play on it everywhere (laughter). Q. There's no nervousness anymore when you go out there? SAMPRAS: No. I was nervous the first time I play there I believe in '92. Over the years, I've been out there so many times, it's a comfortable court that I have grown to love. It's almost like a calming effect because I'm so comfortable out there, I feel like, just as I said before, I'm at my court at home. Q. The seeding that Wimbledon has done, are you a fan of that? Is it fair? SAMPRAS: I think it mathematically makes sense. You have 8 seeds for 32, 16 for 64. I know it loses a little bit of its early-round upsets, whatever you want to call it. I think most players like it. When you only have 16 seeds, you can play someone 18 in the world in the first round. That's not always the fairest thing. It's nice to see all the tournaments have decided to do this. I think you'll see the tennis will be fine, it will be exciting. I don't think it will have a huge impact on the tournament. Q. I'd like to ask if you think the number of rivals you potentially have at Wimbledon every year is growing or is pretty much staying about the same the last few years? SAMPRAS: It's stayed pretty much about the same. I mean, I think we have the same ones. You have obviously Andre, Patrick Rafter, the two Brits in Rusedski and Henman. We have two that aren't here, Krajicek and Philippoussis, that could win here potentially one day. It's pretty much the same. If anything, still a lot of challenges. Over the years I was beating Becker and Stich and Edberg, seemed there were a lot more grass court players five years ago than they were today. That being said, there's still enough threatening guys that could knock me off. Q. The players are saying it's injuries, but the call-offs, particularly in light of talk of boycotts and stuff like, that does that in any way diminish Wimbledon for you with a Kuerten not being there? SAMPRAS: Not at all. Wimbledon is still the biggest event in the game. It's unfortunate that some of the guys aren't here. I hope it's not a trend that you see every year. I think to see the top player in the world not here is disappointing. But Wimbledon is Wimbledon. It will always stand out from the rest, in my eyes. I don't think it will lose anything. I just hope that not a lot of guys do it in the future; that everyone continues to play. Q. You mentioned earlier, you're closing in on 30. This is making you an old man by tennis standards, isn't it? SAMPRAS: It's mind over matter. Look at it as more experience. Q. Have injuries taken their toll over the years? Do you find as you get older, it's harder to stay healthy for the whole season? SAMPRAS: You know, not as much as when I was 22. I still had little injuries here and there, every year I played. I think hurting my back a couple years ago at The Open kind of woke me up to kind of taking care of my body as you get older, being a little more conscious of being in good shape, being warmed up, doing the proper stretching. You have to do that as you get older. I've been healthy for quite some time. Hopefully it stays that way. Q. I know you haven't walked into Wimbledon with an Australian Open and French Open, but you certainly walk in trying to make the record and other pressure situations. How does that break down actually? SAMPRAS: When you're used to it, I've been used to being the man to beat here, you just know what to expect, you know what it feels like to be on centre court. Come Monday at 1:00, you know what it feels like to play the finals. I can sit here and put myself in those situations, know what it's going to be like. When you're prepared for it, it can only help. But the confidence that I have out there, the game that I feel like I possess on grass definitely stands out. You know, on the other hand, guys are coming out against me with nothing to lose. It could be the win of their career. There's pressure from that standpoint. Obviously, a run isn't going to last forever. This one day will end. Hopefully it will be when I'm 35 and done. Q. When you're trying to do something really big, like make the record last year, does it hit you every day when you go out there, or does it hit you at strange times? SAMPRAS: As far as the pressure? SAMPRAS: Well, you know, it's all relative. You look at pressure and look at a lot of the pressure that I feel is self-induced. I feel is self-induced. I felt that last year at this point where I felt like it was a good opportunity to break the record. But you always have this ability of feeling it, knowing it. But actually when you toss the ball for the first point, you shut everything out, just get in the heat of the moment, your game takes over. Your muscle memory gets you through some pressure situations. You get through it and you deal with the same thing again the next day. Q. Could you give us the highlights of married life so far? SAMPRAS: Highlights (laughter)? With my wife here, we live together now, we're together a lot, I'm with someone that I'm going to spend the rest of my life with. There's a lot of good things happening in my life. MensTennis.com participated in a conference call interview with U.S. Davis Cup team member and current world No. 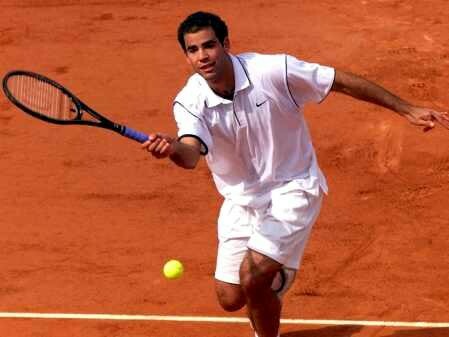 4 Pete Sampras, recent winner of the Ericsson Open in April. We caught up with Pete at his home in L.A. where he continues to nurse a quad injury which will keep him out of the upcoming Italian Open, a key tune-up for Roland Garros. He is expected to return to action at the German Open in Hamburg, beginning May 15th. Q. Are you actually on a court and hitting balls yet or is that still to come? PETE SAMPRAS: Well, I am trying and I am on the court -- I am on the court hitting, but I am not doing a lot of explosive movement and there's still a little bit of tenderness and obviously I am trying to stay in shape somehow, but I am not able to really play any sets. And if you can't do that at this point, you are not going to be ready to play. Still a bit of a process that I am going through. I should hopefully be one hundred percent within a week's time. Q. Was it at all a temptation to skip the clay season this year and wait for the grass, where you obviously have a better chance? PETE SAMPRAS: No, it was never a consideration. I just always figured I was going to play on the dirt and hopefully get through and play well at the French. It never crossed my mind. Q. What is the biggest surprise this year? Which tournament result was the biggest surprise for you and why? PETE SAMPRAS: Well, I don't think there has been any major surprises. I think Lleyton Hewitt has been a pleasant surprise. He has had a great year; he has won a lot of matches, but I think the year has been pretty smooth and predictable. Q. Compared to last year, what will you change in your game to play good tennis on clay at the French Open? PETE SAMPRAS: Well, hopefully I can just play well. The last couple of years I haven't played too well at the French for a number of reasons, but this year I am going to get over to the clay in a couple of week's time and hopefully get into a good groove over there and hopefully, by the French, I will be playing my best tennis. But I just need to play well and the courts at Paris can be quick, the conditions can be quick, and I just have to let go of the pressure I put on myself and just play like I would be playing the other Grand Slams. Q. At Monte Carlo, Alex Corretja was saying that while it is a great idea to have these Masters Series tournaments, something really should be done to make sure there is some rest between the tournaments rather than having back-to-back events, which is happening a lot. Otherwise, the top players are just not going to be able to cope with the Grand Slams and Davis Cup in between. He knows it's a difficult problem, but it's not an impossible one. PETE SAMPRAS: Well, it is a tough schedule. Especially when you throw Davis Cup in there and you have back-to-back events; Rome, Hamburg are back-to-back. Basically you're playing six matches in a week, 64 player draws. It is definitely going to take its toll. Alex has a good point. It is not an easy schedule, but it is the schedule we have in place. That is why you might not have all the guys playing all the tournaments, so I think that's what you see happening. But I think they need to space out these tournaments and try to figure out a better schedule. Q. When you look ahead to the summer and Davis Cup, do you feel the upcoming match with Spain is going to be even tougher because it's on clay? PETE SAMPRAS: Yeah, and the timing of the tie is not going to be easy because obviously we are all going to be playing on the grass for a month and go home for a little bit and then come back for the clay. Probably the toughest tie and the toughest timing of a tie we need to play. Q. Do you see any hope to figure out something to do about the doubles point? PETE SAMPRAS: Well, you know, I was hoping to be playing in L.A. I told John that and he seemed to go with the other guys. I am sure, depending on what happens over the weekend, I may be able to play in Spain. It's a big point and it could definitely change the course of the weekend. It is up to John and what he thinks is the best team, but if it's held in L.A. I was hoping -- I wanted to play. Q. Can you take us through how you felt after the Ericsson and when you got hurt in Davis Cup and then the three weeks since then - maybe false alarms thinking you were better and why it has dragged on this long? 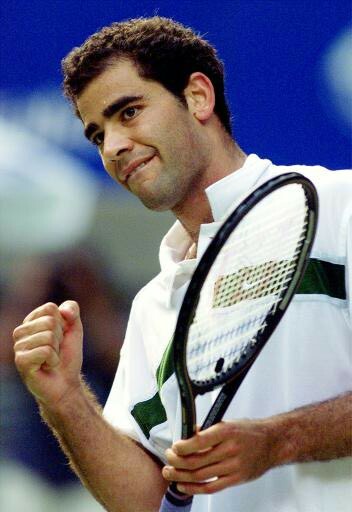 PETE SAMPRAS: Obviously the Ericsson was a tough win. The final was a pretty physically demanding match. I came to L.A. a little bit tired and had one day off and started practicing on Tuesday and didn't give myself a chance to really recover from a tough week and trying to grind it on Tuesday all the way through the weekend. My legs were a little bit stiff after the tournament. I continued to play on it which made it worse and worse and took an MRI the next day and I had a tear. I think I came back a little bit too soon and kind of redid it a little bit as I am trying get ready for the clay court season. But at this point, I am trying to be a little bit more conservative. My goal is to try to win the French and to make sure I am 100%. Q. When you had the chance to finish that second set against Kuerten at the Ericsson, do you regret that maybe you could have finished it off quicker? PETE SAMPRAS: I think about that quite a bit. Yeah. Absolutely. It could have been a 1, 4 and 3 match. I could have been out of there within a half hour, but I lost that set and the whole match changed and I fought physically at the end. That definitely wasn't the way I wanted to go in the L.A. Davis Cup, feeling that tired and it is hard to say if that would have had any impact on my squad, but it definitely didn't help. Q. You have had this succession of injuries now dating back to the US Open and Australian Open and your back against Corretja; now the quad. Is this a run of bad luck or are you coming to the realization that you have had years of playing and not just playing, but going deep into tournaments where you have to play almost every day? Who is training you now? PETE SAMPRAS: I'm working with Brett Stevens who has been on the Tour for years and has been in L.A. and we have been working together for the past year or so. After the back, these injuries since then, I don't have an explanation. I just feel like it could be the wear and tear of playing a lot of years; could be bad preparation; bad warming up before I play, going into Davis Cup playing a lot the week before. It is probably a situation where it gets cumulative over the years, but knock on wood. I have three or four years to get into the best shape possible. Q. Are you changing the intensity of your training; for example, the duration of it? PETE SAMPRAS: I'm pretty much doing the same things I have done over the past 10 years, doing a lot of running when I can and lifting and biking and spending more time in the pool to give the legs a rest. I'm doing it with the same intensity; that is why living in L.A., I have hired Moose. He is actually going to probably move here. He changed my diet, I eat healthier, and try to do whatever I can. These injuries, if anything, are very frustrating because I am putting in the time. I have high twitch (muscle) fibers that if they are not completely ready and warmed up, I am going to have little pulls and that is kind of what has been happening. Q. You talked a lot about how disappointing the injury was after Davis Cup. Is being in L.A., being around fans, given you any kind of reaction from people just in terms of pulling out the final match? PETE SAMPRAS: Yeah, it was a great moment for me and my family and to share it with them and next morning to get on the cover of the L.A. times is quite a thrill. Just going to some Laker games and just walking around the city, people really saw it and really got into it. It was obviously the reason -- what makes Davis Cup quite special and playing in my hometown made it even that much more special. So I felt a good buzz about tennis in L.A. and what a big sport it is. So it was fun to be a part of it. Q. How much time were you actually off the court between your last Davis Cup match and when you started hitting again? PETE SAMPRAS: I was off for about three weeks. I just couldn't do much and I just recently got on the court to keep the arm and my hand kind of tough so it doesn't get too sore, but I am still not able to run 100% and sprint the way I like to obviously. I could maybe go to Rome, but I am probably going to be risking it and would obviously much rather be 100% than '95%, so that is where I'm at. I'm Just going to take it slow and be conservative about when I come back. Q. Is this the first time in recent memory where you had just two clay court events before the French Open? PETE SAMPRAS: A lot of years I have done that and I had a schedule where they had Rome, World Team Cup, I did that for about four straight years and actually did pretty well at the French those years and the last couple of years I've mixed it up. The French is still a little ways away and hopefully I am going to have enough time to get ready. Q. Going back to the doubles at Davis Cup. Captain McEnroe has said that he would like to see you and Andre play together. We know Andre has never played a doubles match in Davis Cup. Your thoughts on that combination and is there someone you would prefer to play with? PETE SAMPRAS: Well, playing with Andre would be special. It would be pretty intimidating to play the best returner in the world and possibly the best server in the world. I know he doesn't play much, but we can figure it out - how he can hold serve and so I think it certainly would have been exciting in L.A. to have done that, but it didn't happen. I am open to playing with anybody. Obviously I am comfortable playing with Todd. We played well in Moscow and that was on clay. We compliment each other with our games. So I am open to playing with anybody. Q. Have you discussed this at all with Andre or has McEnroe nixed the idea? PETE SAMPRAS: Well, it wasn't really talked about much the week of L.A.. I mentioned something to Andre in Miami about he and I playing and it was kind of like a thought. Like I said before, I told him (McEnroe) I was available to play doubles and I would have loved to have played on Saturday, especially after what happened on Friday; but that was his call. It is a big point. It is a live point, so you want to have the best players out there. Q. Regarding the points race this year. It's mandatory now that you play each of the Master Series events or else players receive a zero. You're going to get a couple of zeros because of the injury. Do you think this is a fair system? Do you think this might cause some of the problems that occurred last year? You may very do well in the Majors but, because of these zeros, may have a difficult time finishing No. 1. PETE SAMPRAS: I knew that going into this year, if I wasn't going to play all of them, that I would have to win a Slam or two to be No. 1. But I can honestly say I am to the point where I have done it for so long and it's not as much of a priority in my tennis, the ranking; and you know, I have done it for six years. I'd love to get back up there, but I am not willing to play all these tournaments now and so I was in a bit of dilemma with my schedule and what to do and having these injuries just kind of forced me into not being able to play; but I am to the point where I am going to do well at the Majors and try to break the record this year. The ranking is just kind of the ranking and it's not really the best indication of the best player in the world at times. Q. The tournament director of Monte Carlo, apparently not fully aware of your injury situation, called you and some other players that didn't make that event, who he felt could have played. He called them "black sheep." Do you feel that it's realistic for players to play all nine of those tournaments (Master Series events) given the injuries and also the fact that you want to peak for the Majors and set up your own schedule? PETE SAMPRAS: When this whole thing got put together I know that it is a big commitment. Nine is a lot. I feel it is maybe a couple too many and especially at this point where I am playing Davis Cup. It definitely puts weeks in there where I would have played like 14 out of 16 weeks if I play all these tournaments, and that is a lot. It's a tough schedule and I think players over this year are going to feel it. You have Kuerten going from Miami, straight to Davis Cup on clay, playing all the way through. It takes its toll. I just feel like I am going to do it, I am going to do it for my tennis and give myself the best schedule for the Slams, to make sure I am ready for those tournaments. Q. One of the biggest highlights this year was having your parents there at the Davis Cup watching you and going through the emotional roller-coaster with you. Do you think it is more likely or less likely that they will go to Wimbledon now? PETE SAMPRAS: I would love for them to come and I don't know if they will come for the two weeks or maybe just if I make the final, but I definitely have expressed that I want them there, just to be a part of that tournament which has been a big part of my career. And I think Davis Cup was a pretty nerve-wracking situation and they sat through the whole thing. At least I can tell them at Wimbledon I have won there a few times, so it is not the end of the world if I don't win there. I'd love for them to hop on a plane and come on over an check it out and be a part of it. We are going to see what happens this year, but my dad has already made reservations to go to Spain for the Davis Cup; but Wimbledon is up in the air. Q. Prediction for game five of the Lakers series? PETE SAMPRAS: We are going to win by 30 -- it is Amazing, I can't believe what is going on. If anything this could be good for the Lakers. It all goes in a cycle.The 26-year old No.1 from Tampa, Florida, has been the key player for tennis in the US over the past years along with Andre Agassi, Michael Chang and Jim Courier. Question: Americans have been dominating the game over the past years. Now the Spanish have taken over that place. Where do you see the reason for this development? Sampras: I think it all goes in a cycle, as far as tennis is concerned and the countries dominating it. You had Sweden dominating the game quite a number of years ago. American tennis is still doing very well. The Spaniards have made a move in the past couple years. Question: Talking about the Spanish players: What do you think about the Spanish 'armada'? Sampras: They're very similar in their games. They all pretty much stay back. They have the good groundstrokes, the good heart, the determination to go out and win. They grew up on clay. They're all very solid. Question: Where do you see the reason for their success? Sampras: I think they have each other to really get better. I think once they saw Bruguera make his move a couple years ago, they just kind of fed off each other, like we did in the US after McEnroe and Connors. Question: Does that make you feel envious? Sampras: No. I think we have some good, young players. I don't know if they'll have the impact of what I, Andre or Michael or Jim have done. But it's really hard to say what's going to happen in the future. Question: Who is to blame for the fact that there are no new players coming up at the moment? Sampras: I don't know who to blame. You can't blame the USTA. Who knows, in 10 years' time, we might have 4, 5 young Americans. I think we'll be fine. "I think we all have to start with the serve"
Question: A lot of people think interest in tennis is down in the United States. Do you think that's accurate? Sampras: Well, I still think the interest in tennis in the States is very good. When I played a couple of summer tournaments, the crowds were very good. Question: For kids who aspire to be the next Pete Sampras, what would you say is the most important part of their game that they should work on. Sampras: I think we all have to start with the serve, which is a huge weapon in today's game. What I always tell kids is that playing well is more important than winning. Sampras: Not to rush things, I guess. I've always had longterm goals: To one day be a good pro. Winning the 14th hardcourt event wasn't the priority, it was developing my game. Just look at longterm goals, not at the present, because you can definitely learn a lot more from losing than winning - at least I have. Sampras: A lot of it is just my personality. I've always been kind of laid back. You cannot do anything about bad line calls. They will always happen. Just try to play the next point. Don't lose your composure. Q. Was there a helpless feeling? 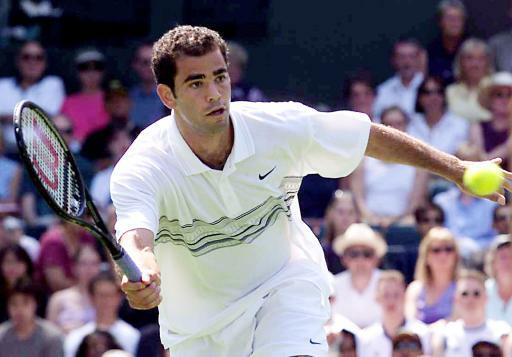 PETE SAMPRAS: At one point, there was. I mean, I was trying everything against Marat. I mean, trying to chip-and-charge, stay back a little bit. Whatever I tried, he had the answers, he really did. I give him all the credit because he returned my serve and passed me just about as well as anyone. You know, I wasn't on top of my game, but I think he had a lot to do with it. I mean, he was serving huge. Really never had any impression on his service games. As a result, he was able to be pretty free on his return games. Hit a couple good passes to break me in the first and kind of steamrolled from there. You know, he was on. With his game, as big as he hits the ball, when he's on, he's very, very tough to beat. Q. Right near the end, the last ten minutes or so, it looked like there was a shot for something to happen for you. What was going on? PETE SAMPRAS: Well, I finally got a couple second serves to look at. Once I saw some of those, I got into a bit of a rhythm. But he was serving huge. I mean, anytime you can serve that big, that consistently, there's not much I can do. You know, I wasn't hitting the ball that great. It was a little bit breezy down there. I had a couple chances. You know, he came up with two big serves on break points. You know, he came out, you know, just played great. He played a great match, he really did. I mean, he did everything as well as you can do it. Q. Did you feel you were off rhythm or was it Safin who put you off your rhythm? PETE SAMPRAS: No, I felt fine throughout the first set. You know, he hit a great return to break me at 5-4. Boom, with his serve, one break is the set. You know, even though I lost the first, I still felt I was playing fine. Then I kind of lost a little bit of rhythm on my serve, just kind of dug myself a hole in the second. It just kind of steamrolled into the third. Before I knew it, I was down two sets and a break. That's a tough hole to get out of. But I felt fine. I mean, I wasn't at my best, but I think Marat had a lot to do with that. Q. Were you shocked that he didn't succumb to any kind of pressure of being in this kind of situation? PETE SAMPRAS: Well, like I said on the court, it reminded me of when I was 19 years old and steamrolled over Andre. I was steamrolled today by him. The only time he showed any nerves was the last game. But he hardly missed. I mean, he really -- I don't know how many errors he hit, but it seemed like he hardly missed a shot. You know, certainly if it's closer, one set all, maybe he'll miss a little bit. But he got off to a good lead and he grew with confidence. But he hardly missed a shot. Q. How are you physically today? You saw the trainer. PETE SAMPRAS: Fine. Just fine. I mean, it gets tougher, the older you get, to go back-to-back. But I felt fine. No problems with my body. Q. Did you sense early on, you held serve the first game, looked sharp, was there a decline after that at all? PETE SAMPRAS: Just broke me at 4-All, I believe. You know, if it gets close, maybe he misses a couple shots, he broke me there, he grew with confidence. You know, it was a little bit breezy down there so it helped out his serve a little bit. He hardly missed. I mean, I was hoping, in this big match, that he might come out a little bit tight, miss a couple shots here or there. But he really didn't. You know, it will be a little bit more difficult next year for him. But the way he's playing, he's the future of the game. I think he's a good credit to the game because he's a nice guy and will represent the sport of tennis very well. Q. Did you suddenly feel old out there? PETE SAMPRAS: I didn't feel old. I felt like I was standing next to a big dude (laughter). I was talking to Trabert. He goes, "He's a big man." I said, "Yeah, he's got a big game." Q. When was the last time somebody played like that against you? PETE SAMPRAS: I played Novak at the Davis Cup. He kind of steamrolled me and played great. It hasn't happened very often that I've been on a barrage of shots like that. I'm usually the one that's doing that. It's a bit of a humbling feeling to have someone play that well for that long. Q. He has more of a complete game than you did at 19? PETE SAMPRAS: I mean, he's just more powerful, I think. He serves harder than I did at 19. Our games were different. I was more of a slasher coming in, serve-and-volleying more. You know, I think with Lleyton, they're the future of the game. Doesn't have very many holes. Moves well for a big guy. Got some great gets today. I mean, he's going to be a threat here. He's going to be a threat at the French, at Australia. The grass might be a struggle. But he's going to win many majors. Q. You talk about the time you were 19, you said it on court, here today. Do you see some intimations of the change of guards? PETE SAMPRAS: Not quite yet. Not quite yet. PETE SAMPRAS: Well, I still feel like, you know, I lost to a young guy that's got a good future, that got hot today. You know, the next time I play him, if it's here next year or down the road, I mean, I'll be surprised if he can play like that for that long. But I don't want to say changing of the guard. Obviously, it's a huge win for him. But I'll be back. Q. The crowd is shouting, "Let's go, Pete." I'm sure you heard it. Were you thinking, "When am I going to turn this around?" What did the crowd do for you? PETE SAMPRAS: The crowd, they were great. They were pulling for me to get going, get a break, and maybe show some life. Any time I had a chance, he came up with some big serves. I had Love-30 that one game in the third. They were just waiting to explode. I was doing the best I could to give them something to cheer about. But he had all the answers. I mean, I tried everything. He had a barrage of shots that I haven't seen in many, many years. Q. Who do you feel is the best player in the world right now with the results up to this day, separate from the Tour's Champions Race? PETE SAMPRAS: Well, the way he played today, I mean, he's one of them. I don't know what the Race is at. I mean, I'm happy with my year and the Grand Slam results that I've had, what happened six weeks ago. Australia, I did okay there. It's hard to say one guy had the best year. It's going to come down to Lisbon. But I feel like I've had a really good year. Q. How is it all going to change for him? You won a Slam at 19. It obviously changes your life. What's going to change for him? PETE SAMPRAS: Just expectations from the people in tennis, the media, and coming back next year defending champion. It's different. He's going to be a marked man for the next year. Guys are going to be wanting to beat him even more now. But he'll handle it fine because his game is good. He'll back it up fine. You know, things will change, but I think he's got a good head on his shoulders. He'll handle it very well. Q. All the passing shots going by you, did you think about changing strategy radically? PETE SAMPRAS: Well, I just felt at times I did try to stay back, I wasn't hitting the ball that cleanly from the back court. He wasn't missing. He was moving me around, making me do a lot more work. The times I did chip-and-charge, I was coming in on some good stuff. Match point, I hit a great approach. You know, he hit a great pass. That was kind of the icing on the cake for him as far as the match went, that match point. Q. Were you surprised with his speed? PETE SAMPRAS: Yeah. I played him in Toronto. I felt his movement was okay, but he came up with some -- one drop volley I had, he hit one great cross-court. He moved well. He's a big guy. He covers a lot of court. Q. Does what happened to you today give you a greater appreciation for what you inflict on other guys when you're playing well? PETE SAMPRAS: Yeah. I can be pretty good sometimes (laughter). Like I've said, it hasn't happened to me that often that I've gotten kind of carved wax like that. But it's happened. I didn't really expect him to -- I knew he was going to play well, but I didn't think he was going to play that well that long. I figured he would get a little bit nervous. He came out swinging away, served huge. You know, the guy's got one of the biggest serves in the game, he really does. I mean, couldn't read it. Just has got a lot of power. Q. Pete, are you able to handle this a little better now because of where you are in your career? You've already broken the records. You seem pretty calm about it, pretty okay with it. PETE SAMPRAS: Well, when you go out and you get outplayed, I'm disappointed, but if I lost 6 in the third, had match points, I'd be in a different mood. But I've just got to accept it. I lost to a better player on the day. That's the way it goes. You know, this year will be a great year for me because of the record and breaking that. Being in the final, nothing to be ashamed of. I know I say I want to win all these, which I do. But, you know, compared to where I was last year, you know, I feel good about some of the wins I had. I mean, I could have lost to Krajicek easily. But when you get to the final, you want to take that next step and put your name on the trophy. That's disappointing. But there are days you just don't have it. Accept the loss to a better player. Q. You don't really seem all that devastated. There's some consolation knowing the guy played so well. PETE SAMPRAS: Well, I mean, I'm just getting off the court. I'm disappointed, but I'm not going to break my racquets, I'm not going to lose it emotionally. It was just a tough loss. There's not much I can really do. I mean, I've just got to accept it. You know, got some important dates in the future this year, getting married, which is obviously a big step in my life. Q. You said last week that you didn't see a men's player out there ready to dominate, become No. 1 for many years. Do you still feel that way? Could Safin do it? PETE SAMPRAS: Well, he could if he wants to do it. I mean, it's a decision that you have to make on your life and how much you want to be on top of the game, deal with the pressures. But he's one of them. I mean, the way he played today and played these two weeks, you know, he can be No. 1 for many, many years. Because of his game, he can play well on the clay, obviously; on the fast hard court; grass, he can do pretty well, I think. I mean, he can really be dominant because of his power. Q. You mentioned the No. 1 spot will probably go down to the wire in Lisbon. Does it interest you, because you're now No. 1 in the Race, does it interest you chasing that or is your mind moving to the next Slam, the Australian? PETE SAMPRAS: Well, I haven't -- I'm sure over the next two, three, four weeks, I'll think about the rest of the year and try to have some icing on the cake, finish No. 1, which would be great. Right now, it's hard really to put it into words. But I'd like to finish No. 1. I mean, if I don't, it doesn't -- it would be disappointing, but I got what I wanted this year, you know, that was the record and Wimbledon, which was nice. Q. It's been five years since you lost in a Grand Slam final. Was it strange to have the sensation again after so long? PETE SAMPRAS: It's weird at the ceremony. I usually hold up the big trophy (smiling). Q. When you were 19 and won here, you had a fearlessness of youth. You said at certain times you didn't know what you were doing then. Do you think he's going to experience that? PETE SAMPRAS: Well, I think whatever he was doing, he was doing it great. I mean, he's much more of a developed player than I was at 19. You know, he's done well at the French. He's been around, in the Top 10. I came from nowhere pretty much. You know, his game is just more developed than I was. I think he'll do very well. Q. How are you going to handle him next time you meet? Are you going to hope he's just not a hundred percent? PETE SAMPRAS: Well, he'll be a hundred percent. I just hope he doesn't play that well. But even if he does, I mean, I let him -- I kind of gave him the lead a little bit, wasn't hitting the ball that well from the back court, didn't put enough pressure on his service games. You know, I'll try some different things. But I didn't have the answers today. Q. You said you tried some things with him, like chip and coming. You mentioned these guys hit a different type of game. The fascination with you is that you've held on with all these sluggers. Do you see yourself as the last of the Mohicans, chip and coming game? PETE SAMPRAS: Well, the game, it's changed a little bit. You look at the young guys coming up, they're all pretty much baseliners. There aren't too many natural serve-and-volleyers, guys that come in a lot. But there's still a lot of power. Marat is serving 130. You know, the future of the game is more baseline, I think. I mean, the only -- you've only got myself and really Rafter, a couple other guys that are natural serve-and-volleyers. You know, don't be surprised in five years, you'll be seeing two baseliners playing the finals of Wimbledon one year. Q. You said that the loss to Edberg really bothered you because you didn't give it everything you had. Could a loss ever bother you like that again? PETE SAMPRAS: No, no. That was just a loss that kind of woke me up a little bit to what I wanted from the game. I gave in a little bit in the match. That changed my career mentally, how much I really wanted to be the best player in the world and win majors. That definitely was a turning point. Q. So then what will this loss do? How do you think you'll look at it? PETE SAMPRAS: I mean, it won't have the same effect it did in '92. I can honestly sit here and say I just got outplayed. I mean, I just lost to a guy that was on. There's not much I can really say. I'll be back next year and hopefully have another chance to play him. Q. Can you describe what happened on that return winner that he broke you the first time. You really looked flat footed. I wouldn't say any of us are used to seeing you look like that. PETE SAMPRAS: I hit 125 up the middle. He hit it back just as hard. I thought it was a let. I thought I heard the beep go off. It wasn't a let. Just kind of a sign of how the day was going to go. You know, he hit a great return. He leaned that way and picked off a great shot. Q. Prior to today, Safin's vulnerability, for lack of a better word, was his mental game. Now that he's cruised through the finals, against you as well, do you think that changes the way people are going to look at him from now on? PETE SAMPRAS: Oh, yeah. I mean, beating me the way he did, I mean, he's going to have an aura about him for the rest of the year and beyond. Being so dominant, playing so great in such a big match. But things will be different for him. Once you win that Grand Slam, you know, the pressure definitely is inflated a little bit. We all have experienced it. I think he'll handle it fine. But I'm sure he'll go through his lulls over his career. I think all in all, he's going to be in contention for Grand Slams forever. Q. You have another record to break at The Masters, since you're tied with Ivan Lendl with five wins. Which one will be your schedule until The Masters? PETE SAMPRAS: I've got Paris and Stuttgart, Lyon. Q. In making a comment about the serve that you thought was a let, you said that was a sign of the way the day will go. Some days just roll that way? PETE SAMPRAS: It was just an expression. I mean, it's just the way -- yeah, it was just the way kind of the day went. I hit a big serve that he came back and hit a great return. Felt like he was seeing the ball well and he was on, definitely on. Q. In the past two days, you've played the two players who many people feel are the future of the game. Do you think Marat is a lot farther ahead than Lleyton? How would you assess the two of them for the coming year or two? PETE SAMPRAS: Just two different players. I mean, Marat is a lot more powerful. Lleyton has the quickness and the heart. It's two contrasting kind of personalities and styles. But, you know, it will be an interesting match if those guys ever play. Q. Do you think they'll be the Pete and Andre of the future? PETE SAMPRAS: It's hard to say. There are other guys that could, you know, threaten them. But, you know, Pete and Andre was pretty special when we had it. You know, it will be a long time before you see two Americans kind of doing what we did for those years.